This is a somber day. 50 years ago the president was killed in Dallas and the city has struggled with the stigma ever since. I admit that I'm impressed with how Dallas is handling this horrible anniversary. When all the hype about the events planned for today was just starting, I thought it was bordering on tacky. Turns out that most of the stuff going on here is respectful and aimed at healing. Those of us old enough to remember will never forget where we were when we heard the news that President John F. Kennedy had been shot while riding in his motorcade in Dealey Plaza. Even for those us who did not live in Texas at that time, it was traumatic. 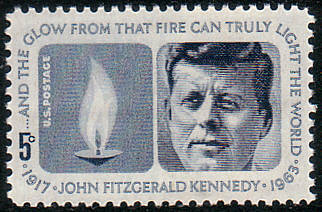 After all, countries around the world were so affected by JFK, that they put his face on their postage stamps. That may be why I am surprised that most of the national television stations do not seem to be giving much acknowledgement to this tragic anniversary. In hindsight, I now find myself wondering why more isn't happening in recognition of this day in history. I even found myself wondering why there wasn't an acknowledgement under the Google logo on Google.com. There will be a ceremony in Dealey Plaza at noon Central Standard Time and I believe some other cities are having a moment of silence at that time. Boston has some remembrance ceremonies scheduled and, of course, President Barack Obama laid a wreath on President Kennedy's grave. But other than a few events like that, I really haven't heard of much else. Perhaps it's for the reasons I stated when I first started this post; maybe publicizing events commemorating an anniversary of this type just seemed tacky? It's not that I think the world should revolve around Dallas, but, after making it my home, I truly hope that today brings closure to many who lived here on November 22, 1963 and for the rest of us, as well. Postage rates went up January 26, 2014 but 2nd Ounce Free continues! Mail Music Monday doesn't get more mail related than this.